Being green is no longer a niche lifestyle for hippy loving greenies. We are all making a definite shift toward a more sustainable lifestyle. Bloggers, influencers, startups and celebrities are promoting a greener way of living and highlighting the global environmental damage happening to our planet. We are reducing the amount of meat we consume, we’re choosing organic produce which is no widely available, and we look to buy locally sourced where we can. Businesses are also following the trend, listening to consumers and supplying the demand for ethical and sustainable products and services. However, what about small businesses? Can they also operate in a green way when budgets are tight and the priority to make the company profitable as soon as possible? The answer is yes! We show you in 5 simple steps how you can create a greener office, which will not only save you money but will bring in new customers. Do you really need all that plastic wrap and polystyrene pellets? Are you shipping small items in large boxes and packing out with paper or plastic air pillows? Assessing, reducing and replacing your packaging techniques is also a great way to promote your business to customers by demonstrating an awareness of waste. A cute message on the delivery explaining your mission to reduce waste is also instantly shareable on social media. Small businesses are unlikely to have the resources and funds to run their own Corporate Social Responsibility program, but you can become an affiliate for larger environmentally friendly organisations such as Greenfleet or Planet Ark. You can either plant a tree to offset your carbon emissions or get your product endorsed as ecologically friendly. If you make people feel good about buying your product or using your service, they are likely to become return customers and spread the word about their experience. Marie Kondo is taking over the world right now, and it’s an excellent opportunity to look around the office and clear out what you don’t need. Taking the time to look around the office will instantly demonstrate how mountains of material things are collected, broken, never used and ultimately stored for years at a time. Be brutal and get your team involved too. You’ll be surprised just how much you can on-sell or donate. The rest, particularly e-waste needs to be disposed of through the correct channels and your local council, can help you with that. Once you have a bright, clean office, you’ll find your staff are more focused and productive and happy making their new area a pleasant place to work. Read my review of Marie Kondo's "The Life Changing Magic Of Tidying up" which is the only book I've ever read (as of this date) that's made me throw it across the room! Moving office or shipping pallets of goods and orders interstate? Use a transporter who operates in a green way. Look for a company which has a backloading logistics model. What is backloading? Well, say a transporter is delivering a car across the state, they will look for transport jobs to fill the trailer on the return journey. Not only is that more profitable for the transporter, but it also means one less truck out on the road emitting Co2 into the atmosphere. Install a water filter tap and give your team a re-usable water bottle and a coffee KeepCup. Ban plastic and straws and promote an office initiative to reduce the waste your business produces. Host a competition, or send a KeepCup or reusable water bottle to new customers as a great marketing tool which is likely to hang around on desks and be used daily with your logo on it. As you implement these programs, you’ll begin to see how not only they will benefit the environment, but that they will also have a positive impact on your business too. Jordan Panos is the founder of environmentally minded delivery service platform, ecoloads.com.au. 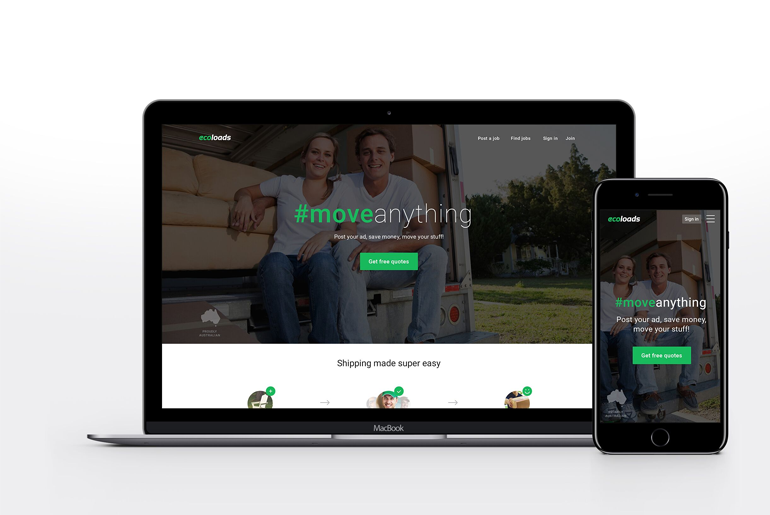 Recently awarded the Westpac Business of Tomorrow Award, ecoloads connects customers who need something moved, with transporter's who have the means to pick up and deliver. The ecoloads mission is to save you costs and cut down CO2 emissions by optimising vehicle spare capacity. Ecoloads has also partnered with Green Fleet to push real climate action, ensuring their 1200+ transporters Australia-wide are keeping it green.